Sunday we posted a lovely quote by Anna Quindlen which was from an almost 20 year old article in the NY Times (click here to read.) Some things are timeless, like good books and reading them to a child. "What a lovely article for Sunday afternoon. Thank you for sharing. I keep meaning to ask if the Big Sister and the Little Sister would be willing to share some of their favorite books that might appeal to a little girl who is almost 5. We are looking for a wonderful new chapter book. Thank you!" Thank you for the request, we had a ball looking over the shelves and talking about the books over a dinner. Here are 10 we came up with --there are MANY more! Brambly Hedge Collection by Jill Barklem The mice of Brambly Hedge know how to have a good time and how to take care of each other. The books are precious and the illustrations, well, even I get lost in the whimsy. The Complete Collection is hard to get but the single editions are available. Find at a Library. 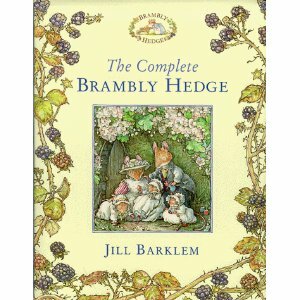 Visit the Brambly Hedge Website. The Cricket in Times Square by George Selden For any child having even the mildest issue with bugs, start here. If you like to read with voices --there is a great opportunity in this book. Find at a Library. More about the book. Stuart Little by E.B. White Both of the Sisters found Stuart everywhere after reading this book --he would follow us on our walks, show up at the dentist, he even has a house in Leland, Michigan. The imagination this book inspired has blossomed. Find at a Library. More about the book. The Beejum Book by Alice O. Howell In the original days of Harry Potter I read the first bunch of books --and while liked reading them, a lot-- decided right then, that I wanted to find something different for the Big Sister (she was about one then.) The Beejum Book is one of the books that I found --a girl, magic, adventures, but unfortunately not a series! Find at a Library. To watch a 3 minute interview with the author, click here. Magic Tree House Series by Mary Pope Osborne Both Sisters like these and I like the places and people the girls are introduced to through the series. I enjoy that I can read a full book to the Little Sister in one sitting, then at the end talk about the facts of the story and off we go to find more! Find at a library. More about the book. The Tale of Despereaux In the first pages of the book, just after the contents there is a quote: "The world is dark, and light is precious. Come close, dear reader. You must trust me. I am telling you a story." That was all we needed to get started! The book is WAY better than the movie! Find at a Library. More about the book. The Miraculous Journey of Edward Tulane This book is heavy, the Big Sister explains, "he loses so many people he loves... it ends good!" We read it in one sitting --even the Little Sister who barely 2 1/2. It is a tear jerker --the reader will need tissues-- but it is an absolute favorite. We've loaned it our to adult friends and they like it just the same. Find it at a Library. Visit the Edward Tulane website. The Mercy Watson Series A pig that subtly saves the day and eats lots and lots of toast (we LOVE toast.) Short books, great transition for an early reader (the text is huge.) I began reading these aloud and the Big Sister finished reading them to herself! Find at a Library. More about the book. The Little House in the Prairie Series by Laura Ingalls Wilder I am guessing you all know about these books. The Sisters have listen to the Mom read them all twice, listened to via audio books over and over. Then the Sisters found more books about Laura's Daughter, Mother and Grandmother --still, the original series is the best. And my parents (the Bean and the Poet) read them when I was little. Learn more about the Series. See where Laura lived. The Chronicles of Narnia by C.S Lewis The true test of a good book: How many times can you listen to a book? How many times can you read it? These books I have easily read a dozen times, it passes the test with flying colors. The Big Sister listened to the Chronicles for the first time when she was barely three (I had to do some editing then) and both Sister's listened to it again last year. Just this week the Big Sister found the complete collection on audio (31 hours!) And they are listening again. Although to my delight, the narrator doesn't do the voices like the Mom. Find at a Library. More about the Series. Add your suggestions for chapter books for children -that are just about 5- in the comments below. Please help us with the Project and tell us where you are from, click here. Thank you so much for this great list. I will be referring back to it, I am sure. We have read The Cricket in Times Square, Stuart Little, a few books from the Magic Tree House Series, the first two from The Little House in the Prairie Series, and the first of The Chronicles of Narnia. . . So, knowing that we have these few in common, I'm sure that we will love the rest of your suggestions. Thank you, again! I second so many in The Big and Little Sisters' list and have added the rest to our to read list - thank you! One of our family favorites is The Littles series by John Peterson. My daughter was captivated by the lives of these tiny people (they have tails but they are NOT mice) who live in the walls of the Big family's house. They are inventive, industrious and master recyclers. what about frog and toad? they crack me up. You know--favorites around here are Kate Di Camillo's Mercy Watson Series, the Toon Books like Jack and the Box (by Art Speigelman of Maus fame) and Silly Lilly and others. Another early reader favorite--more of a read-along (I read a page, you read a page) is Lilly's Purple Plastic Purse by Kevin Henkes, or any of the Knuffle Bunny or Pigeon books by Mo Willems. Many of these authors write books for older children and adults--so children who start reading with them need never leave a favorite behind.